I know this not because my kids have been inching the thermostat north of 68 when they think I’m not looking, or because I can see my breath in my unheated third-floor bathroom when I crawl out of bed in the morning. I know it’s winter because my body isn’t just craving baked pastas, hearty casseroles, thick, rich stews — carb-heavy, oven-made comfort foods that create warmth in the kitchen. It also craves food that warms me up on the inside. In my mind, nothing takes the chill off a brisk January day like a cup of cocoa with a little ground red chile dusted on top. Anything, in fact, that incorporates the fire of hot peppers is a winner this time of year. And if it’s a smoky, tongue-tingling chipotle pepper? All that much better. But it’s only in the past five years or so that chipotles have been turning up in foods you don’t typically associate with heat, such as cookies, cakes, breads, brownies, mac ‘n’ cheese and mashed potatoes. Even Betty Crocker, a traditionalist if there ever was one, has gotten into the act: The new 11th edition of the classic “Big Red” cookbook counts five recipes using the pepper. Chipotles also are breathing fire into craft beer. Fathead’s on the South Side recently created a “Holy Mole Stout” using the smoked peppers, and Oregon-based Rouge makes a deep golden ale with them. (You can find it at The Beer Hive in the Strip District.) And then there are sweets: At Mon Aimee Chocolat in the Strip, chipotle adds spice to Poco Dolece’s “Super Chile” toffee squares, Vosges “Red Fire” chocolate bars and Marich’s absolutely amazing dark-chocolate almonds. It also plays a starring role in one of the best cups of hot chocolate you’ll find in the city. Spicy chocolate might seem to be a novelty, but it’s actually a tradition as old as chocolate itself, noted owner Amy Rosenfield, who at any one time has up to 15 products with chipotle on the store’s shelves. A to-go bag of the spicy cocoa mix costs $10.50 and serves eight. “It goes back to how chocolate got started” by the Aztecs, she said. Technically, any chile pepper that’s been smoked can be referred to as a chipotle (the word comes from the Aztecan chilpoktli, which means “smoked chili pepper”). The vast majority of chipotles are jalapenos that have been kept on the bush long enough to turn red and wrinkly, and then slowly smoked over a wood fire, resulting in a pepper that’s flavorful (smoky and earthy) and packed with exactly the right amount of punch (just enough spice to get your lips tingling). No shrinking violet, the peppers rank between 5,000 to 10,000 on the Scoville scale, or comfortably midway between a spice-free bell pepper and hotter-than-hell ghost pepper. Fruit shrivels when you smoke it, so it takes a whopping 10 pounds of thick-walled jalapenos to make 1 pound of chipotle. Which helps explain why you can buy an entire handful of the fresh green ones for about a buck and a 2-ounce can of whole or chopped hydrated chipotles can run $2.50 or more. 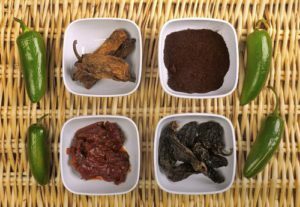 Dry chipotles are more expensive still, with the pods costing $25 a pound at Reyna Food in the Strip District. But oh, what a chest-clearing, aromatic slice of chile heaven. The first hot chiles were smoked into chipotles by the Aztecs to keep them from rotting in the hot Mexican sun. It’s still a slow process, taking 16 hours or more, as well as one that requires some thought because the type of wood used affects the flavor and color of the finished chipotle. Most often it’s a blend of oak, hickory, pecan or other fruit woods. Chipotles, most of which are produced in the Mexican state of Chihuahua, come in two varieties with subtly different flavors: nugget-sized mulberry moritas and the less-common, slightly larger chile mecos, which resemble grayish-brown cigar butts. Reyna carries both varieties in the metal garbage cans that line the back of the store. Stiff and leathery, chipotle pods can be daunting to a first-timer. (What the heck do you do with ’em?) Yet all it takes to bring them back to life is a 20-minute soak in hot water. Then, chop, mince or puree the chiles into a paste. They impart an almost chocolately, deeply smoky flavor to food and sauces. Alas, the pods can be a tough find in mainstream groceries. Home cooks, then, probably are most familiar with canned chipotles packed in adobo, a spicy/sweet tomato-based sauce seasoned with cider vinegar, garlic and onion. There are at least a half-dozen varieties on the market, and counting (Giant Eagle carries San Marcos and Embasa; look for them in the Hispanic section). Almost a finished sauce in itself, this is what flavors the turkey chili and salsa at Big Burrito’s Mad Mex restaurants and the black bean dip and chipotle aioli at Kaya in the Strip. Mr. DiCio prefers making his adobo from scratch. So much in fact, that he will be traveling to San Miguel de Allende in central Mexico later this month so he can perfect his sauce-making skills. “There’s no comparison,” he insists. Prefer your seasonings in sprinkle-friendly containers? Chipotle also comes ground as a spice in which a little goes a long way: 1 1/2 teaspoons of the rich, deep-red powder equals one whole chipotle. Or make your own powder. Stem and seed the pods with a sharp knife, gently toast in a hot, dry skillet for a few minutes (even though they’re dry, they’re not quite dry enough to grind), then grind in a coffee or spice grinder. Even a little chipotle can add burn, especially when it’s packed in adobo or you’re dealing with seeds (that’s where much of the heat is concentrated). So start slowly if you’re afraid of setting your mouth on fire. Spoon in a little at a time, tasting as you go, or fish the peppers out of the stew or soup before serving. In a medium-size saucepan over medium heat, combine the milk and vanilla bean. Heat until the mixture comes to a simmer. Reduce the heat to low and add the chocolate and cocoa powder. Whisk to combine. Simmer for 5 to 10 minutes, or until the mixture coats the back of a spoon. Watch it closely so that it does not boil over. Add the chile powder, a little at a time, to taste. Stir in the honey and blend. Discard the vanilla bean. Pour the hot chocolate into 8 small cups and top with the whipped cream and slivered almonds. 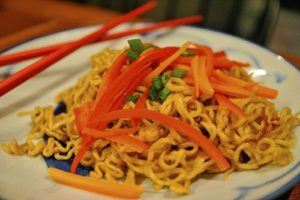 Betty Crocker evokes memories of your mom’s — or grandma’s — cooking, but the old girl nails it with this spicy noodle bowl. It was too hot for my husband, so our son Jack ate the entire bowl. In large bowl, mix peanut butter, apple juice, soy sauce, chiles and adobo sauce until smooth. Stir in cilantro; set aside. In 2-quart saucepan, heat 4 cups water to boiling. Add carrots and bell pepper; cook 1 minute. Remove from water with slotted spoon. Add noodles to water, and cook as directed on package. Drain. Add noodles to peanut butter mixture; toss. Divide noodles among 4 bowls. Top with carrots and bell pepper. Sprinkle with peanuts. The original recipe calls for jalapeno peppers, but chipotles add a nice smoky flavor that lends itself to beef. This dish is rich, with a layer of flavorful fat. If you’d rather skim it off, make it a few hours or even a day ahead of time to give the fat time to rise to the surface. Preheat oven to 325 degrees. Season beef all over with a teaspoon of salt, chipotle powder and black pepper. In a 5-quart Dutch oven over medium-high heat, heat the oil. Add the beef and cook until browned all over, about 8 minutes. Add garlic, minced chipotle, ginger, shallot and cumin and cook, stirring, until everything is fragrant and golden, about 2 minutes more. Stir in coconut milk, lime juice and zest, and remaining salt and pepper to taste with 1/2 cup water. Bring the liquid to a simmer, then cover and transfer the pot to the oven. Cook, turning the meat after an hour, until the beef is very tender, 2 to 21/2 hours. Serve garnished with cilantro and scallions, with additional lime wedges on the side. Preheat oven to 325 degrees. Butter bottom and sides of 8 4-ounce ramekins or one 9-inch cake pan (not springform) and dust with sugar, tapping out excess. Remove stems, seeds and veins of the chiles and toast them flat in a hot skillet over medium heat for 2 to 3 minutes until fragrant, flipping them so they don’t burn. Transfer to a bowl, cover with very hot water and let soak until softened, 20 to 30 minutes. Drain, reserve liquid and puree chiles in a blender or food processor, adding a bit of liquid as needed to form a smooth paste. Press through a fine-mesh sieve if paste isn’t completely smooth. You will need only 11/2 tablespoons of the paste, but you can freeze the rest for later use. Place chocolate in a heatproof bowl. Combine orange juice and sugar in a small pot over medium heat and cook, stirring, until sugar has dissolved. Pour over chocolate and stir until melted and combined. Add butter, little by little, and stir until melted. Whisk in eggs, one at a time, then add 11/2 tablespoons chipotle paste and the flour and salt, stirring until smooth. Pour into the prepared ramekins/pan. Place ramekins, evenly spaced, or pan in a towel-lined baking dish to prevent from sliding. Carefully pour hot water to fill three-fourths of the way up the sides. Bake until a thin, crusty layer forms on top and cake is set, 40 to 45 minutes; if using a cake pan, it will take 50 to 55 minutes to bake. Remove baking dish from oven and remove ramekins with a towel or tongs. Let cool for 10 minutes. Unmold on a plate, then chill in refrigerator for 1 hour. Serve cake at room temperature with Sweet Custard Sauce drizzled on top. Serves 8. Serve with fruit, cookies or cake, sprinkled with cinnamon. Combine milk, lime zest and cinnamon stick and cook over medium heat until bubbles form around edges, 3 to 5 minutes. Meanwhile, combine egg yolks, heavy cream, sugar, cornstarch and salt in a large heatproof bowl and whisk until cornstarch has dissolved and there are no lumps. Gradually whisk half of hot milk mixture into the egg-yolk mixture, then carefully return everything to the saucepan. Continue cooking, stirring often, until it coats the back of a spoon. Strain mixture and chill over an ice bath. Use as a gravy for grilled meat or marinade base. Finished sauce will keep for days if refrigerated, well covered. Measure oil into a large skillet and set over medium heat. When hot, toast chiles 1 or 2 pieces at a time until very toasty smelling and blistered, only a few seconds per side. Pour off all but a generous film of oil from skillet and set aside. Transfer chiles to large bowl and measure in 4 cups hot tap water; a small plate on top will keep chiles submerged. Let rehydrate for about 20 minutes. Measure garlic, oregano, pepper, cumin, cloves and vinegar into a blender or food processor. Pour in rehydrated chiles, liquid and all. Process mixture to a smooth puree. Press through a medium-mesh strainer set over a bowl. Add adobo to skillet and cook over medium heat until reduced to the thickness of tomato paste, about 10 minutes. Stir in broth, reduce heat to medium-low and simmer for 30 minutes. The finished sauce should be quite light in texture, not watery, but just one stage thicker. Season with salt and sugar. It should be a little sour-sweet with a hint of saltiness. Serve warm. Delicious on burgers, grilled meat and fish. Also makes a great vegetable dip. Place chipotles, garlic, lemon zest and juice, egg yolk, water and salt in a blender barrel. Puree. While pureeing, slowly drizzle in blended oil. Pour into a glass container. Keeps for a week in the refrigerator. Spread this foolproof condiment on burgers, spoon it into soup or marinades, or mix with mayo — anything that needs a flavor boost. Pour oil into a heavy ovenproof saucepan and add garlic. Cover pot with foil, put it in oven and cook until garlic turns a nutty brown and is really soft (think cream cheese), about 45 minutes. Remove pot from oven and let cool to room temperature. Put garlic and garlic-infused oil in a food processor or blender. Add chipotles and sauce, cilantro, lime zest and salt and puree until mixture is very smooth. Store in refrigerator for up to 2 weeks or freeze for up to 1 month. These easy shortbreads have just a touch of heat and plenty of chocolate flavor. Whisk together flour, cocoa and chipotle powders, cinnamon and salt in a bowl. Beat together butter and sugar with an electric mixer at medium speed until pale and fluffy. At low speed, mix in flour mixture until well blended. Divide dough in half and pat out into 2 7-inch rounds 1/4-inch thick. Arrange rounds 2 inches apart on an ungreased baking sheet. Cut each round into 8 wedges (do not separate). Prick all over with a fork. Bake until shortbread is dry to touch, 16 to 18 minutes. Recut shortbread while still hot, then cool on sheet. Shortbread will crisp as it cools. These can used to season dishes or served — with a sprinkle of oregano and dash of olive oil — as condiment. Rinse the chiles well — do not soak — and pat dry. Pierce them twice on each side with a sharp fork and set aside. Heat oil in a frying pan, add the onion and garlic, and fry, turning them over from time to time, until they are just becoming translucent, about 20 seconds. Add chiles and continue frying and turning them over for about 8 minutes. Add herbs, vinegar, water, salt and sugar and continue cooking and stirring over medium heat at a fast simmer for about 15 minutes longer if they are very leathery. Transfer to a glass or porcelain bowl and set aside in a cool place or in the bottom of the refrigerator for about 10 days, turning over from bottom to top each day and pressing them down in the liquid, which should just cover the chiles. Pickled chipotles will keep for about 10 days after they are prepared. Cut 1/4 inch off the top of garlic head. Place, cut side up, on center of a square of foil. Drizzle with olive oil and sprinkle with salt and pepper. Wrap head tightly and roast in oven until tender and caramelized, 50 minutes to 1 hour. Remove from oven, unwrap and let cool. While garlic is roasting, peel potatoes and cut into quarters. Place in large saucepan, cover with cold water and add 1 teaspoon salt. Bring to a boil, then reduce heat and simmer until potatoes are tender, about 15 minutes. Drain and put back in saucepan. Heat milk and butter in microwave or small saucepan until just hot, not boiling. Squeeze softened garlic into potatoes and mash together with a hand mixer or masher, whipping in milk and butter and Garlic-Chipotle Love. Season to taste with salt and pepper. Serve at once. Heat oil in a large pot over medium heat. Cook garlic and leek until soft and translucent, about 4 minutes. Add apple, celery and ginger, and cook for 3 minutes. Add sweet potatoes and stock, and simmer until potatoes are tender, about 15 minutes. Add chipotle chile. Working in batches, transfer mixture to a blender, and puree until smooth, transferring soup to a large bowl as you work. Season with salt and pepper. Sprinkle with pepitas before serving. Preheat 2 tablespoons oil in a large skillet. Add sweet potatoes and onion, toss to coat, and cook undisturbed for 6 to 7 minutes, or until nice and crispy. Season with salt and pepper and set aside. In a medium saute pan, combine tamari, brown sugar, chipotle and lime juice and cook over medium heat until reduced by 75 percent, about 5 minutes. Transfer to a blender and blend on high speed, drizzling in remaining 2 tablespoons oil. Wipe out pan. On high heat, add a little cooking oil. Season scallops and then sear on both sides in hot oil, 4 minutes total. Place sweet potato and onion mixture on plate, surround with scallops, drizzle with syrup and garnish with chopped chives. This was great on scrambled eggs. Heat oil in a large skillet set over medium heat. Add onion and peppers and saute until softened, about 5 minutes. Add garlic, tomatoes and salt and cook over medium heat for about 25 minutes. Add vinegar and sugar and cook until mixture has thickened, another 20 to 25 minutes. Pour mixture into a blender with the chipotle chiles and blend until smooth. Return mixture to the heat and simmer until it is about as thick as bottled ketchup, about 30 minutes. Transfer to a container and refrigerate until cold. 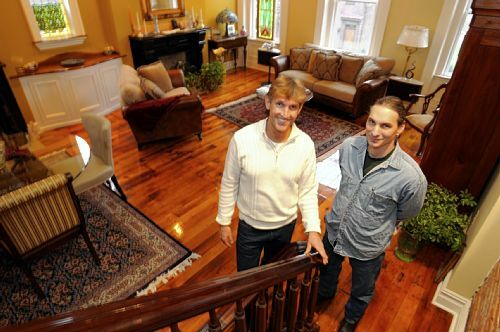 Abandoned, boarded up and stripped clean of its original architectural details, the 150-year-old townhouse in Manchester wasn’t long for this Earth when David McAnallen decided to rescue it from the wrecking ball. 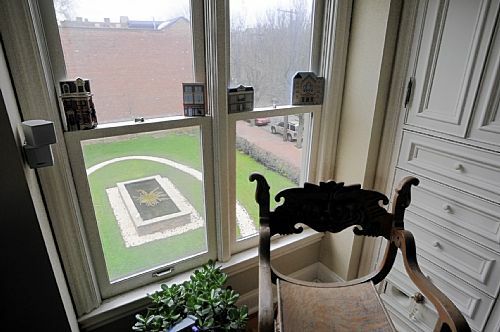 The city had already condemned the once-gracious Second Empire property on Sheffield Street, built sometime in the 1860s, when the city of Allegheny on the bank of the Ohio River vied with the South Side as an industrial center specializing in ships and locomotives. Yet plenty of other homes in similarly bad straits had successfully been renovated, and so Mr. McAnallen, who at the time was living nearby, was pretty sure this sad old lady could be coaxed back to life, too. Ten years in the making, Mr. McAnallen’s home renovation project is arguably among the North Side neighborhood’s finest, from the meticulously restored cornice brackets and window surrounds brightening the red brick exterior, to the exquisite caramel-colored heart pine floors that greet you at the top of the stairs, to the second-floor deck that’s decked out with a gas brick fireplace and provides a bird’s-eye view of the courtyard. Now in its sixth year, the contest judges home renovation projects on a variety of criteria, including functionality and appropriateness of construction and materials. It’s also a nod to homeowners’/designers’ creativity, which with each successive year of the competition has only gotten better. The top dogs in last year’s large category, for example, turned a dilapidated commercial building in Garfield into a envelope-pushing, contemporary “green” home. The deadline for entries in this year’s contest is Tuesday, which means you still have the weekend to pull your entry together in one of two categories: small (projects costing $50,000 or less) or large (more than $50,000). 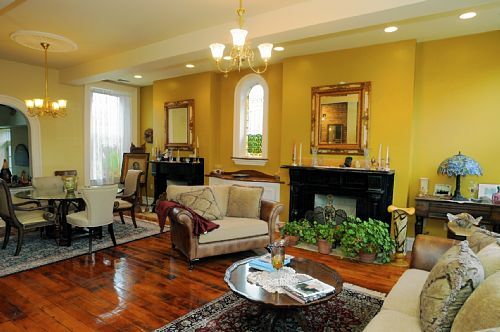 It’s open to both homeowners and home professionals; for details, go to www.post-gazette.com/homes. Mr. McAnallen’s house is too big to be considered an actual diamond in the rough, but even boarded up, there was no mistaking its potential. Blessed with beautiful arching windows, high ceilings and elaborate moldings and brackets, the three-story house reflected Manchester’s wave of prosperity in the late 19th and early 20th centuries. Still, it took some cajoling from his good friend Jim Spiegel, a real estate broker and developer in Erie, for the psychologist to make that leap of faith. The red tape hassles that come with buying a condemned property were just the first of many headaches. Given the size and scope of the project, Mr. McAnallen would also need to find a capable, not to mention versatile and collaborative, general contractor who would turn his vision into something concrete. He found all that, and then some, in Eddie Pinto of Bellevue. With the hint of a smile, Mr. McAnallen recalls being told he was “nuts” when he offered Mr. Pinto the job. But three weeks later the contractor was at his door, negotiating his fee. The bulk of the work, which included turning the first floor into an apartment for rent, took the better part of two years. Floors had to be sanded and varnished; walls required patching and painting; new windows had to be installed; and, of course, the house needed all new plumbing, heating and electric. There also was the matter of a leaking roof, and the (very) slow process of acquiring the eight lots next door from the city so he could create a side courtyard. Mr. McAnallen admits that during those first intense months, there were moments of “sheer panic” when he was sure he’d taken on more than he could handle. Somehow, though, he never lost hope. Many of the home’s “new” 19th-century architectural details came from antique shops and salvage yards. He found one of a pair of slate mantels for the living room in a Verona basement and its sister on the back of a truck outside Construction Junction. The staircase to the second floor came from an antique shop in New Castle. Other design elements only look old but are actually brand-spanking new. Stephen Schuler of Emerald Glass in Washington, Pa., did all of the colorful custom stained glass and also created the etched glass in the double entry. 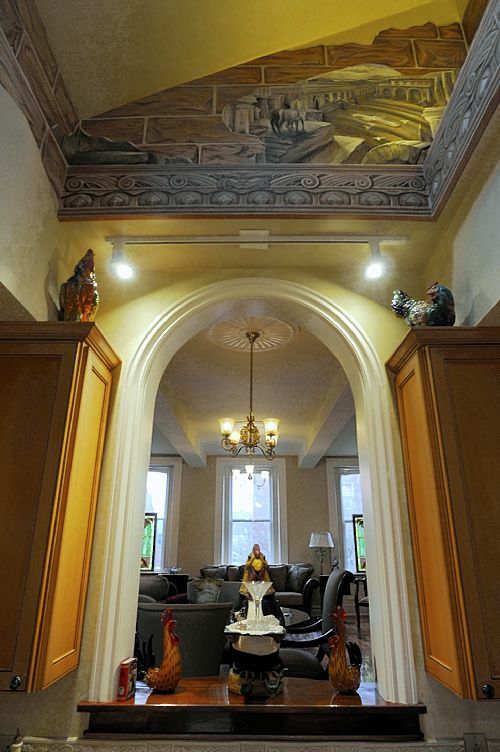 The classic mural in the vaulted kitchen, inspired by a Gustav Dore engraving, is the work of Fombell-native-turned Hollywood photographer Ken Heusey. He’d just finished painting a mural decorating a terrace overlooking the beer garden at Hofbrauhaus Pittsburgh on the South Side when Mr. McAnallen met him, rather serendipitously, at the North Side YMCA. Then there’s Mr. Pinto, whose capable hands free-formed the high-relief plaster trim seen throughout much of the house. He also crafted the focal point in the main living space, a curvy walnut electronics cabinet that sits between the living and dining room mantels. The elegant oxbow is a recurring shape inside and outside the house, turning up in the kitchen breakfast nook and window sills, under the stained-glass window in the living room, and the pass-through to the kitchen. It’s also in the courtyard in the form of a gently meandering brick patio. Equal parts taskmaster and perfectionist, Mr. Pinto was adamant things be done to his standards. Mr. McAnallen was given one week to sand and patch the windows in the living room. No more, no less. A much longer project was a rear addition that removed a slanted roof that rendered much of the space on the third floor unusable. Graced with three sun-welcoming dormers, it’s now a spacious TV room that opens through glass French doors onto an open-air deck. Mr. McAnallen is still working on a second-floor guest room and the spiral staircase off its small covered porch that takes visitors down into the backyard (he found it on Craigslist). But the master bedroom is a finished gem with its matching window seats, skylights, built-in dressers and rustic exposed-brick walls. The courtyard, anchored by a large oval koi pond with an “eclipse” of bright-white rock, also is very much a work in progress. Yet even in these early stages, you can tell it’s going to be nothing short of an urban oasis, and not just because it measures a whopping third of an acre. Landscaped with honey locust, Japanese maple and climbing and regular hydrangeas, it’s a tranquil and unexpected slice of green amid a sea of brick and asphalt. Eventually, Mr. McAnallen said, the space will include a pergola, and the arborvitae and holly bushes running along the sidewalk will grow tall enough to completely contain it. Until then, there’s always the view from the roof. “I love it from here,” he said.